Friars are special monks that do a service to a community and that lead a simple life, rather than living like ascets in a monastery. There are two classes of orders known as friars, or mendicant orders: the four "great orders" and the so-called "lesser orders". The Dominicans, founded ca. 1215. 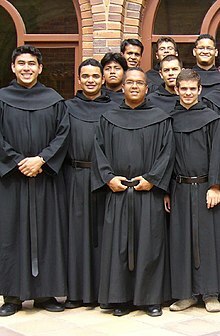 The Dominicans are also known as the "Friar Preachers", or the "Black Friars", from the black mantle ("cappa") worn over their white habit. The Dominicans were founded by St. Dominic and received papal approval from Honorius III, in 1216 as the "Ordo Praedicatorum" under the Rule of St. Augustine. They became a mendicant order in 1221. The Franciscans, founded in 1209. The Franciscans are also known as the "Friars Minor" or the "Grey Friars". The Franciscans were founded by St. Francis of Assisi and received oral papal approval by Innocent III in 1209 and formal papal confirmation by Honorius III in 1223. The Carmelites, founded ca. 1155. The Carmelites are also known as the "White Friars" because of the white cloak which covers their brown habit. They received papal approval from Honorius III in 1226 and later by Innocent IV in 1247. The Carmelites were founded as a purely contemplative order, but became mendicants in 1245. There are two types of Carmelites, the Calced and Discalced Carmelites. The Augustinians, founded in 1255. The Augustinians are also known as the "Hermits of St. Augustine", or the "Austin Friars". Their rule is based on the writings of Augustine of Hippo. The Augustinians were assembled from various groups of hermits as a mendicant order by Alexander IV, from whom they obtained papal approval in 1255. ↑ The Carmelite order was founded around 1155 according to many modern historians, but this date is often disputed, and has been disputed since at least the 14th century. ↑ The Third Order Regular of St. Francis are a branch of the third order of St. Francis, part of the Franciscan Order. ↑ The Capuchin are a branch of the Franciscan Order. ↑ The Discalced Carmelites are a branch of the Carmelites. ↑ The Order of Penance is known in Italy as the Scalzetti. This page was last changed on 4 June 2018, at 04:29.